Making a menu plan and ensuring all the ingredients are bought on a bulk run. I think it’s important to use whatever method suits you best. For us, options 2 and 3 work best for us. I took a lot of inspiration from the Organised Housewife during this whole process. So first things first – in order to meal prep, I had to organise our fridge to store the fruit and veggies that I cut up. I decided to keep all the fruit and veggies in clear plastic, airtight containers so I hopped online and found some for a bargain price. Making sure the containers could be stacked, could store within themselves when not in use was a big factor for me, as I hate taking up space with containers just because they don’t store well. Once I had our containers, I gave our fridge a clean out. I wiped all the shelves down, gave it a good clean out of items that were past their expiry, and rearranged – did you know the fridge door is the warmest area? Here’s what our fridge looked like before I started organising it. It was actually in worse shape than this, I just forgot to take a photo before I began its makeover. I moved all of our sauces, spreads and condiments to the fridge door, as I didn’t realise this was the warmest area, and moved our defrosted meat to the bottom shelf. Unfortunately our fridge is quite small, so we’ll have to keep our milk in the door because this is the only place it fits! Once the fridge was freshly cleaned, I started thinking about what I wanted to chop and what I wanted to keep whole. I had to decide what I wanted to access quickly and easily – this list might change depending on your personal preference. The above is what I decided to chop and keep whole, based on our eating habits. We always add broccoli, sweet potato and cauliflower to meals to steam or stir fry, so having these prepared in florets would make life a lot easier for us. I also cook zoodles as a healthy alternative to pasta, so having this ready to go would save precious time in the evening. I had a huge focus on healthy snacks, so anything to make the decision easier when we’re ravenous is great – that’s why I chose to have carrots and celery cut up into accessible sticks! Once I had everything decided, it was time to begin the chopping process. I had just completed a bulk shop of our fruit and veggies for 2 weeks. It took me about an hour to chop and store everything, but I think this process will be quicker in future because the containers will already be organised. I kept a bag to place all the scrap in, and just kept chopping until everything was done and in it’s container. This hour straight after shopping will make life so much easier this week – it’s worth it just for that! So the end result of our organising is our fruit and veggies and all chopped up ready to go, and accessible in these clear, airtight containers. Using clear containers means we can see exactly what each container holds, and how much is left. I broke down the organisation of our meal prep into meal times; breakfast, lunch, dinner, and snacks. I plan on meal prepping on a Sunday, and will cook some healthy snacks (dips, bliss balls) and store in containers in the fridge. I’m a little concerned we won’t have enough space to store hehe! I meal prep vanilla chia seed pudding (recipe here) in glass, airtight mason jars. This allows us to easily add fruit and museli just before we eat it. Adding it before might mean it spoils, or goes soft. Once I do our grocery shop, I’ll split yoghurt into containers which we can grab and go easily in the morning. We also have smoothies with protein powder in the mornings (especially after a workout! ), so my next plan is to bag smoothie ingredients into seperate ziploc bag, kind of like this. They’ll stay in our freezer, and will have the ingredients that need to be added on the bag – this should save us some time each day as we usually race around trying to find everything in the mornings! I’ve ordered some wide mouth mason jars in order to make mason jar salads for lunch. If you haven’t heard of mason jar salads don’t worry, I hadn’t either until I started researching meal prepping. Basically you strategically put everything into a jar including dressings, and store until ready to use. Provided they’ve been packed correctly, you can keep salads fresh for 4 to 5 days, so it’s the perfect solution for lunch times. Our pre-cut veggies will help when creating these salads. 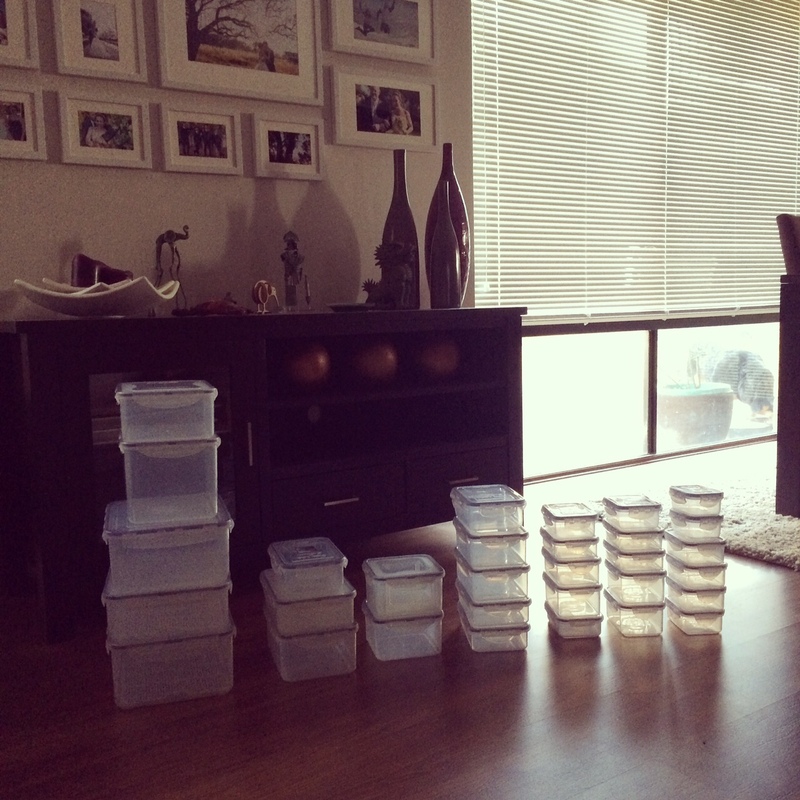 I haven’t received our jars yet, but I’m planning to do a post of meal prep + mason jar salads once I’ve received them. Mr A & I are blessed to have a Thermomix, so dinners are pretty easy for us. Meal prep will be assisted with the pre-cut veggies – all I’ll need to do is make sure whatever protein I’m using is defrosted. Our menu plan will help by giving me an overview of what meat needs to come out the night before. We plan to have carrots, celery and snap peas for healthy snacks. I’m indecided if we will use containers, or ziploc bags for these snacks. For us, it will depend on space – ziploc bags take up less room! :) . By having everything ready to go, all we have to do is pull and go in the mornings. I’ll also be boiling some eggs up so they’re all ready to go for snacks at work. 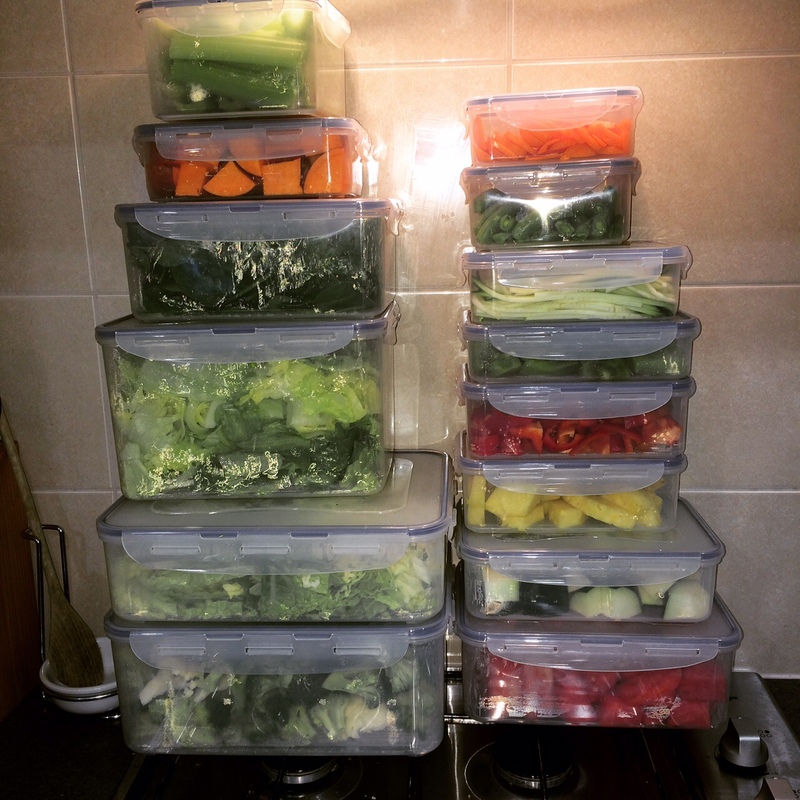 I’ve only just completed the chopping as of last night, and my meal prep is definitely a work in progress – it will be a moving target based on what suits our lifestyle best, and what plans we have on during the week. The important thing to remember is meal prepping is supposed to help you, so if you’re stressing about it, don’t bite off too big a bite at once! If you’ve never thought of meal prepping before, try using a menu plan for a couple of weeks. Once you’re used to this, you can try different ways of prepare meal items to help you save time. I’ll be posting more once we receive our mason jars, and once I’ve done a grocery shop to show you how things are all stored. I wanted to share a list of some of the items I’ll be preparing on the weekend – dips, bliss balls, and baked treats. Healthy snacks is the biggest factor for our lifestyle change for us, because I usually end up grabbing something unhealthy only because it is quick and easy. I feel inspired! I followed your gym efforts (something I would never do because being too lazy….) and have to congratulate you for the work done! But this food organization is gorgeous! Will follow your example for sure! I love meal prepping! It’s one of the things that has made the most positive impact on our daily lives! We actually prep pretty much everything for the whole week (cooked and all), which means grab and go for taking our lunches and heating up items for breakfast and dinner :-) Also, I have mason jar salads every day for lunch! They are amazing! Ah awesome! Do you have any mason jar salad recipes that you recommend? I would love to prep everything, but I don’t think we have enough fridge space to prepare everything that I’d like .. it’s pretty full in our fridge already! Ummm layered taco jar?! Yes please!!! !